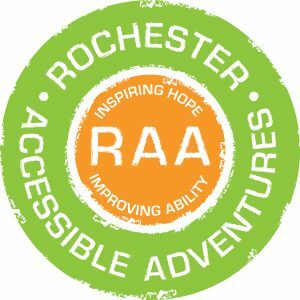 Rochester Accessible Adventures (RAA) is committed to partnering with the community to ensure access to recreation and sports opportunities for individuals with disabilities and their family and friends. We promote a service model which trains municipalities and businesses to operate accessibly and inclusively whenever they are open for business. RAA also partners with adaptive sports teams such as the Rochester Wheels wheelchair basketball team and Rochester Sled Hockey to ensure sustainable, long lasting sports opportunities. Additionally, RAA is a regional resource center, providing crucial community connections to keep individuals with disabilities and their families connected to the resources they need. As a partner in the Commit to Inclusion movement, RAA will incorporate the principles of Commit to Inclusion in our website and our social media. We will continue to actively promote inclusion efforts, such as our recent rollout of The APACC — Rochester’s FIRST Adaptive and Paddling Center — and will gladly continue advocating for our community and others to embrace what must become a national effort to address the systemic need for inclusion. We will continue to educate, train, and implement inclusion in all of our efforts.